The birth rate for U.S. teenagers ages 15-19 fell 2 percent in 2008 to 41.5 per 1,000, reversing a brief two-year increase that had halted the long-term decline from 1991 to 2005. The birth rate for unmarried women declined about 2 percent to 52.0 per 1,000 aged 15-44. This was the first decline since 2001 and 2002. However, the number and percentage of births to unmarried women each increased to historic levels. The preliminary number of U.S. births in 2008 was 4,251,095, down nearly 2 percent from 2007. The estimated total fertility rate in 2008 was 2,085.5 births per 1,000 women, 2 percent lower than the rate in 2007. The cesarean delivery rate rose to 32.3 percent in 2008, the twelfth consecutive year of increase. Increases were seen among women of all age groups, and most race and ethnic groups. 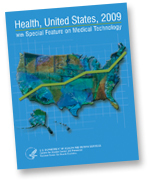 The recent report “Electronic Medical Record Use by Office-based Physicians and Their Practices: United States, 2007” presents new information from the 2007 National Hospital Ambulatory Medical Care Survey regarding the growing use of electronic medical records systems by office-based physicians as well as their plans to install new electronic medical record systems within the next 3 years. Physicians in practices with 11 or more physicians were most likely to use either all electronic or partially electronic (part paper and part electronic) systems (74.3 percent), whereas physicians in solo practice were least likely to use electronic medical records systems (20.6 percent). Electronic medical record use was higher among physicians in multi-specialty practices (52.5 percent) than in solo or single-specialty practices (30.3 percent). For more information, visit the report at http://www.cdc.gov/nchs/data/databriefs/db22.htm. For the complete listing of states, visit the report. In 2005, Louisiana also topped all 50 states with its homicide and injury by firearms rate, with 12.9 homicides per 100,000 population and 18.6 injuries by firearms per 100,000 population. For the complete list of states, visit the report.